SWG Thought of the Day: Galloping Ghosts! Shouldn't there be at least one mount that's faster then at least one vehicle not named (something like) hover chair or mechno chair? 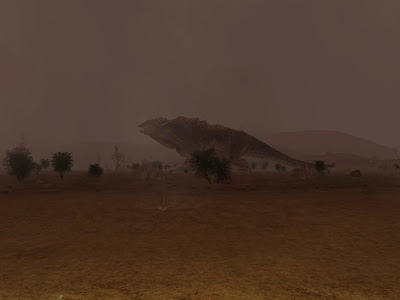 Obi's Episode 3 Boga did a fine good job galloping along with Grievous' vehicle on Utapau. Speed up the mounts - at least when they're galloping. Pick one. That's right. Or just throw a dart. Heave a stone. Spit in the general direction. Do so, and you're likely to hit another post about the state of the SWG servers. As I type this, the login server is the latest victim... because why should only one galaxy be affected? 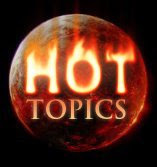 I got to a count of 14 posts before I both lost interest in the tally and decided that it was already significant enough to consider this a "Hot Topic" worthy of the planet of Mustafar that graces the back of the logo used. Jedi. No Jedi. Armor. No armor. NGE. Pre-NGE. Decay. No Decay. Divide the community any way you like, but I think we can all agree that server downtime is no fun, nor is it acceptable with the frequency it's been happening. Go ahead. Dash on over to the Game Play Discussion forum and have a look for yourself. The natives are restless and they've a right to be. Did you notice that even the Jedi General Kota in the Force Unleashed video game wore armor, even if it was ornamental. Let's face it, Lucas and his many organizations have absolutely zero problems with Jedi wearing armor. But for some reason, SOE and the anti-Jedi crowd seem to be against the concept, with the latter often throwing ridiculous fits or demanding the ability to equip ornamental lightsabers if Jedi were to get statless armor. Is it a top priority that Jedi get statless armor for the Appearance Tab? Absolutely not. The new appearance options should be enough to appease just about everyone who's taken umbrage with the system prior to AdeptStrain's wondeful brain child. Should it be added in a future update as a small, value-added feature of the system? I tend to think so; there is no good reason I've heard yet that suggests Jedi shouldn't have the same appearance options as everyone else. The point is... it's canonical. SOE is listening, or at least they guessed right for once. The latest gift to players is the All Powerful Sarlacc. Well, at least a miniaturized version. The item is a decorative one that animates and looks well done -at least for what it is. But here's the kicker: active subscribers will see that their sarlacc does something that sarlaccs gifted to returning vets do not. Follow the link and learn more (or don't) but like it or not it's a trend that should continue. Catering to the subscribers is good business! Those who don't pay might be lured in by the good customer service and value added. Just the way capitalism intended. Now all we need to do is fix the fact that Veteran Reward months are counted even if not paid for. Baby steps, taken first by baby sarlaccs. Mounts did not always have to be mysterious creatures that teleported in and forced you into their saddle. 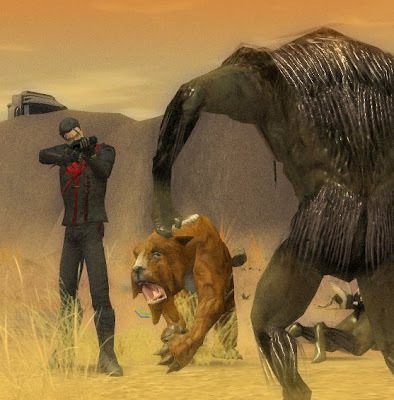 While they may have deployed from the datapad like all good conveyances, they at least had the dignity of standing there animating while you went about your duties of conversing with NPCs, engaged in a fight or just stood around posing with your significant other as in this picture with V-Squad members Yambrul and Phantom. The change of implementation might be up for debate, but I would bet it has something to do with some demographic of jackoffs who managed to grief people with their mount, thus causing us all to lose our abilities; typical of SOE in these past five and a half years. Now, in almost every way, mounts are inferior to vehicles; no exceptions. But while the "target audience" wouldn't settle for something that doesn't speed them to their "click this for your reward" objective, there remains enough in the playerbase who still enjoy galloping their way from point "a" to point "b" while atop one of these magnificent creatures, despite their shortcomings. Temporary Enemy Flags (TEFs) were an interesting way to make the galaxy feel real and dangerous. If you felt you were ill-prepared to handle the consequences, you either prepared yourself, played it uber-safe, or sat this one out. The problem is, the system was used to grief players (big surprise there!) and the concept was removed from the game - likely to never return. Very unfortunate. It would have been better if we could have just removed the griefers. Then we'd have a rather engaging Galactic Civil War as well as player-run cities that were defendable by the militia. Now we have to play romper room because of a very few number of morons who ruined the game by taking advantage of a system that was not perfect in execution, but very original and interesting in concept. It began as a simple training exercise for myself and my trusted pet Amber, a plains tusk cat who is coming into her own as an able bodied companion in the most heated of battles. Upon returning home to Oracle Base, I was curious at the tracks I had found in the rocky sand. Amber immediately became restless and irritated. I have been around animals enough to know when something isn't right. And that's when the hot winds of Lok shifted and brought to my nose the familiar and choking stench of Gurks. They had made a makeshift rally point just beyond the base; no less then 30 of them on a quick count. And they were primed for a war party. With no time to even call for backup, Amber and I dove into battle, feeling that surprise would be our only tactic. They sent wave after wave, and the body count was piling up. At one point, they overwhelmed me, and only Amber kept them from finishing me off for good. Their whelps were particularly fierce, leaping onto my cats back and rending at her with their flat but sharp nails. My new E-11 was tested. I lost count after the initial few, but there may have been close to 100 that rallied around their makeshift nest that afternoon. They had no intention on finishing what they started. As I've suspected before, Gurks are smarter then they appear. I wonder now. Am I still the hunter or have I become the hunted? Does it really upset non-Jedi gameplay and immersion so much that appearance-only armor might be considered for Jedi? People really do obsess about this profession to an unhealthy degree. Seriously, what difference does it make if Jedi are afforded the same customization options that are available to others; that were available to them prior to being forced into a staring profession? And for those who want to flip it around and say that the non-Jedi should be allowed to wear Jedi robes? Pfft. Go ahead! Why should Jedi be the only ones who look ridiculously out of place when they wear them? A compromise would be to create Jedi-specific, non-statted armor; pieces that might echo those worn by Jedi in the Clone Wars cartoon or in the other media (Star Wars Legacy?). But of course, if Jedi get any sort of treatment the native revolt and will either fight to block such an feature or demand they they get these new non-effect armor pieces as well. If everyone spent half as much time worrying about their own profession rather then the trivial matters pertaining to Jedi requests, the game would run far smoother. Did you notice that we are only into the second day of the Free Character Transfer Service and the Starsider galaxy is listed "Very Heavy"? A few other galaxies are even listed as "Heavy". So much for the assumption that most people would not transfer to the servers that are considered to have been the heaviest prior to the promotion. If the lag could be sorted out, one could say that the transfer promotion was a marked success. But as I write this, Starsider is "Loading..."
As I said yesterday, it's just like old times. With the Free Character Transfer Service in full swing, and the new Appearance Tab, the servers are buzzing with excitement and activity. Some of the shops I've visited have had multiple customers browsing the wares and even interacting. I've also seen transferees fitting into their new homes, recognizing old faces that came with them, and making new friends. This isn't the "Cure All" for what SWG needs, but damn if it isn't a step in the right direction. In just two days SOE has given us new levels of customization and then turned around and helped bring the community closer together via the transfers. If they can just nail the Player City update, we'll have a re-energized population ready to take this game back in a positive direction. Well done, SOE. Well done! Poll Results: What Did You Do For Life Day? Life Day is over for another season, and from the general feedback heard around the galaxy it would seem that this year was the most exciting and well-received yet. Artoo has been asked to analyze the data gathered regarding what everyone did for this festive event. 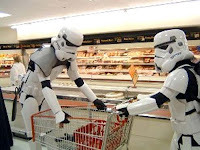 Regardless of political views, Rebel sympathizers and Imperials alike took advantage of some of the new and unique gifts and decorated their home. From the young Wroshyr trees to the presents, holo table to the proton chair, there were many opportunities to make ones home a festive place. Maybe the Imperials didn't stomp all the presents, but stole a few for their homes! Life Day is more then just trimming trees, smashing presents or decorating houses. Going on active Special Forces duty was a big part of Life Day, and it was popular on both sides of the Galactic Civil War. Among the smallest vote getters were the grinches who did nothing for Life Day. (Fine, be that way!) Quite possibly they had their in-game music turned down because hearing just one small blurb of the Modal Nodes was sure to put even the scroogiest in the holiday mood. But to each their own; just what was it about the Life Day event that did not appeal to these select few? 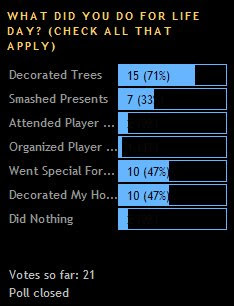 One visitor organized a Player Event during the Life Day festivities, while a few others put on their holiday finest and attended an event as a guest. One of the strengths of Star Wars Galaxies is the tools available to build storyteller and player events. Such participation should be encouraged and made more readily available to newer players who may not know of these possibilities. Could there be a better way - in game - to advertise such events? Thanks again to Artoo for giving us the breakdown, and many thanks to everyone who participated in the poll. Happy Life Day! SWG Thought of the Day: No Trade? No Way! A quick thought today... do away completely with "No Trade" restrictions. It's a player-driven economy. If a player wants to trade something, it should be allowed. Is there any good reason to keep "No Trade"? No way. 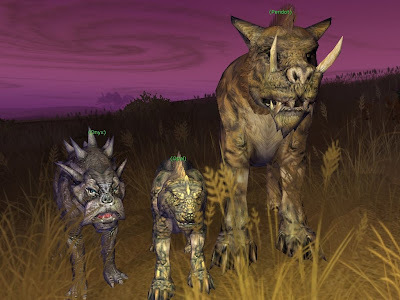 The Creature Handling system allowed players to deploy multiple pets, depending upon both their level of skill and the level of the pets in question. A Creature Handler could either decide upon one strong pet, or a makeup of up to three pets that were individually weaker then a single, but offered more flexibility and attacking options. Vincer preferred to use cats for his combat-related adventures. Operating in a support role as a Squad Leader with some First Aid abilities, the three pets Onyx, Opal and Peridot offered many opportunities to help the squad in their endeavors. Usually, a fight would begin by Vincer selecting the primary target. Once the squad was set, the three "gem" kitties would be sent in: Peridot first - the strongest of the three, then Onyx... and finally Opal, the youngest and most vulnerable. Vincer would give the order for the squad to engage after the required number of cats had picked up their targets and acquired their aggression. With the battle in full tilt, the cats could be called back individually for heals. This freed the squad's combat medic from worrying too much about the cats and concentrate on the others. By individually controlling the pets, each could be sent onto a different opponent in order to tank for the squad. Opal would rarely get a chance to take on an enemy all by herself, though. The Squad Leader/Creature Handler support role was an engrossing position to play. Charged with choosing, acquiring and holding opponents with agression were the primary goals. The squad found it a boon to have up to three tanks to keep the enemy occupied, but were not frustrated by the pets as they were not "stealing the show" by being more powerful then the team. To see the whole squad - complete with pets - in action was a thing of beauty. It wasn't always a sure-fire recipe for victory, but the system was sound and everyone learned their parts to play to turn the squad into an effective fighting unit. Inspiration finally struck me, so I decided to figure out how the whole +35 modifier system worked. I feel as thought I was misinformed when told that the only way to do this was to gather the required components via an AFK macro, and then charge millions of credits for the final product. With some dedication and determination, I was able to consistently accomplish +35 modifier bits while being ATK. The process was quite simple, really. Build a suit that consisted of Luck and Reverse Engineering. Gather junk. This can be done over several sessions. An hour here, and hour there. To make life even easier, gather junk from higher level PvE opponents to get "Stat"-clothes with higher numbers. Get to RE-ing with the Casual Shirts and the looted junk. Basically... that's it. Anyone who would tell you that it's some advanced and time-consuming system is lying. I am a very casual player; so for me to be able to accomplish this should speak volumes. Don't get ripped off by those who justify their high prices by saying it's difficult. Don't be fooled by those who say it must be done with the aid of AFK loot macros. It's all simply not true... since it's all so very simple. We are only weeks away from the next holiday festival in Star Wars Galaxies. This one is a bit more ambiguous then the Life Day event that is winding down. But who doesn't like a holiday? Here are a few ideas that would allow us to include this holiday and still stick to canon as much as possible. The Festival should be held on Endor. Ewoks have no way of getting off their homeworld. No Combatant or Special Forces should be allowed - we're going for peace and love here, people. Leave the armor and weapons out of it for this one. Dueling is prohibited within x meters of the Festival. Ewok themed song and dance for entertainers. An Ewok instructor leads the performance. Certain flourishes are required. Success will unlock the dance and/or song. A quest to unlock a vehicle schematic for Engineers - Ewok Glider. The Engineer must gather materials and craft certain Ewok-themed items in a certain time to get the schematic. If failed, the quest can be tried again. The glider works like a jetpack, but is not as quick of course. It's wind powered! Can't be used on Musty - it might catch fire. Permanent-use storyteller tokens (because Ewoks love stories): A hut, makeshift throne, cooking fire and spit, trees, complete with houses and walkways, etc. (Tokens can only be used on Endor. To get the Storyteller tokens, the player must tell a story via dialogue to a group of Ewok youths. If the youths are entertained, a token is awarded. Get Hitched! Every hour, Chief Chirpa oversees a union between players. Any who attend the event and use the Propose Union system will take part in the ceremony and receive a house decoration item that when examined has the name of the couple on it. One time quest only! Divorces aren't in the spirit of the Festival! New Chef recipe: Ewok Candies (effect TBD). To get the recipe, convince the Ewok chefs not to cook some of the NPC guests over their firepits. A suitable replacement for the dinner must be found. Speaking with the Chief, you learn that he has a hunger for (random Endor creature). Acquire hide, milk, bone or meat from the animal - make any recipe with those parts and give it to the chefs to complete the quest. Imperial scouting report. Complete any single Festival quest, then return back to an Imperial recruiter. Tell the recruiter that the Ewoks are harmless and receive a GCW point bonus. Rebel scouting report. Complete any single Festival quest, then return back to a Rebel recruiter. Tell the recruiter that the Ewoks may proof beneficial someday and receive a GCW point bonus. The "scouting report" quests are in the spirit of Star Wars canon. Some non-movie media (I believe it was in the RPG books) stated that the Empire briefly studied the Ewoks and found them to be harmless; not a threat to Imperial rule. I thought it might be fun to allow players to take part in that "study". Personally, my favorite is "Get Hitched!". Nothing says "love" in Star Wars Galaxies like a Union. With romance in the air, how fun would it be to have an iconic Star Wars persona oversee the ceremony? Scratch that. My favorite would be the title "Part of the Tribe". Despite there being far too many buffs in the game, the one profession whose chief function is to provide buffs (entertainers, feel free to argue) is largely forgotten in the grand scheme of "buff to do stuff". Allowing such stacking - the mixing and the matching - on such consumables would allow customers to pick their own meals to suit their purposes, while chefs would be able to perfect their art by experimenting on quantity, nutrional value and/or filling. Chew on that, why don't you? Several topics floating around our favorite GPD involves things such as elder rewards, titles, defunct names, abandoned houses and other things associated with older accounts - inactive, reactivated or otherwise. A very troubling aspect of the Free Character Transfer promotion is the fact that many names will be unavailable for transferees when they arrive on their new server home. While SOE has provisions to rename these toons, oftentimes the name is no longer used; perhaps even years old after the previous name owner cancelled their account. While a name change may not be the worst thing in the world, it underscores a problem that SOE has when dealing with these long gone accounts: the refusal to let go and allow the current subscribers the chance to inherit the game and help it grow. This game will forever be stuck in a holding pattern if we continue to cater to non-paying subscribers and mollycoddle cry-babies who threaten to cancel whenever discussions turn towards significant and necessary changes. Making difficult decisions is what defines a leadership. SOE has to realize that a good bulk of those dormant accounts are going to remain that way in the current global economy situation and with an ever-increasing number of competitor products in the MMO market. SOE should cut loose where appropriate and take care of the subscribers it has, not the subscribers that it lost. I despise when things are done half-arsed; this is something that should have been considered. And while we're at it, stop counting non-subscribed months towards veteran rewards. It defeats the entire purpose of the reward program. It is not an easy decision to alter and/or remove such information, but a failure to gratify the current subscriber base will lead to more dormant accounts that clog up the name table and the landscape. When the cat's away, the mice will play. I saw no less then three mean-spirited attacks on the developers yesterday on the GPD. A fourth seemed to indicate a level of frustration and impatience that the Friday Feature is obviously no longer something that SOE is doing. There is this whole "holiday" thing going on, you realize. Not only are we, the players, often hard on the developers but we also don't use the term "devs" correctly at times. We also do not often give the developers the proper credit they deserve for working within the confines of SOE under the auspices of Lucas Arts. Somewhere along the chain of command, there is one guy in charge of pushing all the buttons that keeps SWG going. Let's call this fellow "Epic Fail". Because Epic Fail has no clue about Star Wars, MMOs, or the current subscriber demographic (or even how to attract potential subscribers), we are hit with a game that still has all the potential in the world, but very little in the way of delivering on that potential. This is no fault of the developers. Epic Fail pushes a button and our favorite red-names are left with no choice but to make the best of the situation - including putting nice and proper spins on the concepts in the form of release notes, Friday Features and other communications that Valara gives to us. So in the spirit of the holiday and of a clean slate, fresh start, new year, let's give some credit and love to the developers. They are all that stands between us and Epic Fail, and through them we shall have our Star Wars. 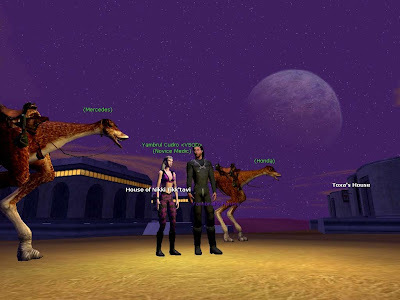 Shortly after the launch of Star Wars Galaxies, SOE began a series of monthly story arcs for both Rebel and Imperial players. The compiled results of each side were compared and one side would be deemed "the winner". The missions brought players together to work towards their common goals. On Starsider, the Rebellion was victorious during the start of the "Cries of Alderaan" quest, awarding bonus Rebel points when normally earned. The story arc must have been too costly, since it did not lose popularity. Only months into the game, the arcs were abandoned. 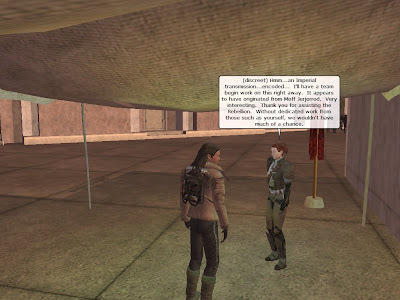 Here we see Vincer turning in a coded message to an agent of the Rebellion in Coronet, but what you can't hear is a small music clip that made the event seem momentous. (Apparently it's the little things that count.) The entire squad (the V-Squad) worked together to acquire the various pieces. There was a room in the lower level of the guild hall that was littered with the various pieces and those in the guild were permitted to take what they wanted and leave their extras. To this day, the Decoder used to decipher the message which was shared by the entire guild, sits in Vincer's office, a memento to times past and a potential future. If SWG is ever going to evolve into a more engaging and exciting game, SOE must "bite the bullet" and ignore the potential whiners and crybabies and go forth, crack a few eggs and make one hell of an omelet. Here are a few "controversial" changes that should be made despite encouraging the whiners to whine and the target audience to think. Species traits - Shouldn't Wookiees be stronger then Bothans? Less Buffs - Only a few available slots: Profession, Doctor, Entertainer, Food, Drink, Clothing, Weapon, Group, and Misc. Stop the buff wars. No Magic Heal Spells - Seriously. It's stupid. Harsher Penalties - Ban griefers. Stop credit spammers. Perma-ban credit buyers. Crafter Combat Levels - Reduce their combat level OR add specials. It's currently crap. Heroic Instances - No more. Player Cities - Full control for mayors and citizens; bring back /citywarn. Griefers are perma-banned. TCG Loot - No more. Too bad, SOE. Next time, make a card game that people want to buy for it not for another game. Credit Sinks - More of them. I don't care how ridiculous and "unfun" they might be. Credits NEED to leave this game. GCW - Supercharge the Empire and make them the rulers of the galaxy; no questions asked. Then we'll figure out a way to have the Alliance stage a rebellion. That's just a small list of things that came to mind over the last ten minutes. They're all very "high level", and clearly need much more thought. But what does it matter? SOE is far too scared to make any significant change; either because the code is too old or they fear that subscribers will take their money and go. I may revisit this list. Future installments of "SWG Idea" may go into further detail. There are other less "controversial" ideas I've got floating around. You've seen the Ranger suggestion. I have a very cool Brawler/Teras Kasi system that I may be inspired to write up some day. (And if you thought TK was cool, you're going to love it.) But these are the ideas that I know will evoke the most amount of tears. So we'll start there. And if you don't like the list: too bad. Actually, good. You've probably become complacent and satisfied to have mastered a simplistic game that's lost it's way. You probably fear the notion that you might have to relearn the system or -gasp - even need to think. Get over yourself, if that's you. Star Wars Galaxies isn't all about you. Right now, it's really not all about anything. It's just a mish-mash of some game systems (some of which are entertaining, some of which... meh) that hold our interest from time to time. It has very little to do with that space opera in a galaxy far, far away; the story that we grew up with, dreamt about and imagined we could be a part of. This game offers us the chance to be a part of the greatest story of our time. But until we stop behaving like we don't want to accept any changes to this game, we will be condemned to playing a shell of the games real potential. There are those on the official forums that would have you believe that there is such a thing as a piloting community; those who are both perceived to be a part of it, and those who are against that select groups assumed agenda. What a ridiculous notion: a piloting community. Rather, there are those who prefer the piloting and space systems to the exclusion of most other aspects of Star Wars Galaxies. It is their belief that space should be enhanced with a dedicated development team; enhanced in such a way that many feel would be sufficient if it had no ties to the ground portion of this game. It is inaccurate to call them the "piloting community" since they do not represent all pilots. As a pilot myself, I do not believe in the views of this so-called "community". The odds are quite great that I am not alone in my stance. It is as unfair to lump me - or any other - into this "pilot community" as it would be to pick a percentage of Beast Masters who press for the full return of the Creature Handler system and call them the "Beast Master Community". But doing so both serves the agenda of the proponents of these wishes, and undermines the voices that oppose them. They represent their own views and should not be referred to with such a broad title. Regardless of what name they should be called, they should be careful what they wish for. Having a dedicated development team for the purpose of space and piloting attention is what caused the current alienation of said systems. But that is my opinion and view; not the views of the Beast Master community, Politician community, Spy community, or Beta Testers community for what it's worth. Nor are their opinions representative of the Pilot community.